Logo Launch, Rebrand, and Celebrating 25 Years! What a year for the Trust! Term 1 saw the Impact Facilitators working with four schools whose students completed a range of exciting projects. Each group had a unique range of interests from water conservation, to used tyre playgrounds, to local food production. Inglewood primary had a conservation focus choosing to support their native trail area along the school's river boundary. The group was visited by guest speakers from the TRC and Rotokare Reserve to help identify the native plants and weeds, as well as birds and reptiles in the area. They identified and removed a patch of wild garlic, made up bird boxes from recycled wood to attract in birds, and created signs identifying native birds in the area. Norfolk Primary decided on an upcycling project after researching the impact of used tyres on the environment, They created a climbing wall out of used tyres for their school to enjoy, which was installed on the side of a playground fort. To raise awareness in their community about the issue with used tyres the students then painted a sign about their project for all to see. Egmont Village Primary students became aware of water conservation challenges when New Plymouth's water pipe was damaged in February. They decided to educate their community on the importance of saving water and the actions people can take by creating a video. The video was a hit with the head of the water treatment plant at NPDC who visited the students to talk about the local water supply. The students also helped their school by installing a recycled 1000 litre water tank to collect rain water for use on the school vegetable garden. Spotswood College students wanted to support the school community by providing the food tech room with fresh, local, package free fruit. To do this they started an orchard, researching what fruit the food tech classes could use and what varieties of fruit could be planted in autumn. The trees they planted will be added to by later groups with support of the horticulture teacher. As always, we are inspired by the creative ideas and actions of the youth we work with who are undertaking real world and positive environmental actions. 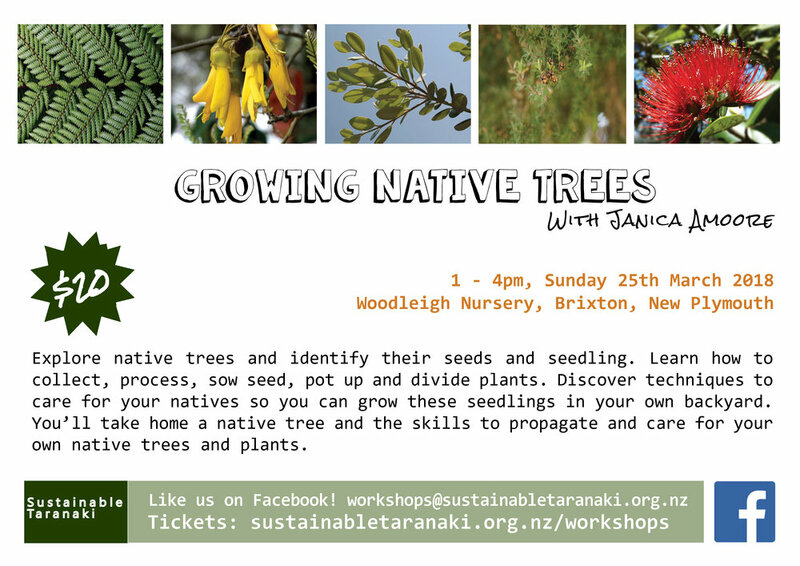 A big thank you to TRC, NPDC and Rotakare Trust for supporting the groups with guest speakers and to Tricky Trees Specialists for providing free mulch for the Spotswood orchard. Coming up in Term 2 we will be working with the NPBHS Green Team, Patea Area School, Hawera Intermediate and Devon Intermediate. Kati Freeman, the GM of Sustainable Taranaki is interviewed by Charlotte Littlewood on the Hokonui Breakfast Show where she discusses the rebrand and new logo for Sustainable Taranaki, formerly known as the Taranaki Environmental Education Trust publicly. Kati has impressive credentials and is a skilled communicator who is leading the way for Sustainable Taranaki supported by a great team of Trustees and coordinators. Have a quick listen to learn what's in the pipeline. Hokonui intelligent radio featuring local people. Have a read of "Sustainability pioneers launch new name" by Christine Walsh. In the first school term the Impact team have been working with groups of youth throughout the region. Each group has been really creative in researching sustainability projects in which they can take positive action on. Inglewood Primary have a beautiful forested area along a stream on the edge of their property. The Impact team want to identify what native trees, bird life and reptiles are in the area and make educational signs to share this with their community. They are also planning to take out weeds in the area and plant more native trees. Norfolk Primary are currently in the early stages of working towards an upcycling project, using waste materials to create something for the school. Egmont Village Primary students are interested in water conservation, with the school being on rain water supply for their drinking water. They are researching how they can collect rainwater for their school vegetable garden. They are are looking to make a short documentary film to educate their community about how to save water. Spotwood College are in the early stages of designing an orchard space near the boundary with Spotswod Primary. Their idea is to involve both schools in learning about growing your own produce. In Term 4 last year, Highlands Intermediate students focused on growing fruit trees to address the issue of food miles, the resulting environmental impact, and the need in the community to provide free healthy food. The students investigated possible sites, considering water, sun, wind and access. Following this, it was decided that the current school vege garden was the area they would like to develop further. They surveyed the student body's preferences for fruit, and from within this looked at what trees are suitable to plant at in late spring. They selected citrus and passion fruit, and developed a longer term plan along side this to continue planting next winter when pip and stone fruits can be planted. Year 8 students at Coastal School focused on two areas of interest, growing local food and undertaking an upcycling project. The orchard group investigated possible sites, considering water, sun, wind and access. Following this it was decided that the current school orchard was well placed and they would like to extend this. "Working with Erin and Laine from Impact was transformational in the way I look at environmental education at Highlands Intermediate. Their process highly engaged the students, and had a successful project outcome. Great education, and great action." Pat Swason, Highlands Intermediate. Being aware that the current New Plymouth landfill is due to close soon, the upcycling group wanted to make some outside furniture out of waste materials otherwise destined for landfill. They deconstructed pallets and created a table, then created seats out of old tyres and pillows. After discussing where they would like to place their creation it was decided to donate it to the local daycare centre, painting the top in chalkboard paint so that the children could make draw on the table. The table and chairs were then taken down to the daycare centre and donated to the children, where they spoke about their project to staff and children. IMPACT an invitation to step up, get involved, and contribute to an environmentally sustainable world. 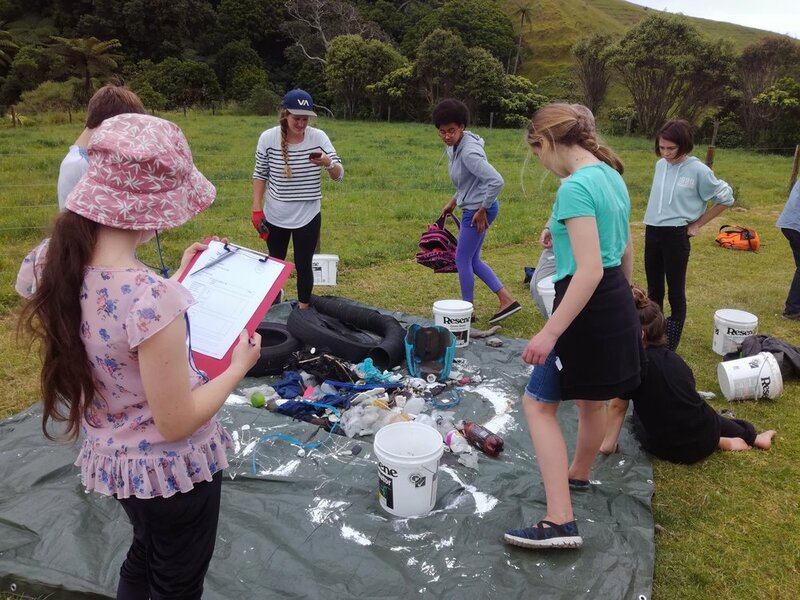 Term 4 has seen the Impact team working with Coastal School, Oakura and Omata Primary's and Highlands Intermediate on a range of sustainability initiatives – upcycling, orchard planting, beach clean-ups and increasing biodiversity. Oakura school's group decided to work within their Enviro Centre, an outdoor area that has been planted with natives and fruit trees around 5 years ago. The Enviro Centre also provides outdoor learning spaces for the school. After brainstorming ideas, they chose to work to enhance the bird-life in the centre; and therefore, researched and built bird boxes that are suitable to native birds, such as tuis and bell birds. They also built a bird feeding station to encourage birds into the space. The youth look forward to watching the birds flourish in their newly adapted natural habitat. After looking into a range of environmental impacts, the students at Omata school were inspired to reduce the rubbish in the area. They first undertook a school liter clean up and audit to investigate what types of wastes were being created at the school. Following this, they organised a beach clean up at their local Tapuae beach. Inspired by Lorella Doherty of Rethinking Plastic Revolution and the artwork she has created from plastics up-cycled from our beaches, the students then created an ocean themed artwork to present to the school to educate the younger students about the impact of littering and how it affects the ocean environment. Great work Omata! Information packs are available for schools and youth services on request. Have you seen our latest newsletter? We are excited to share some news with you. 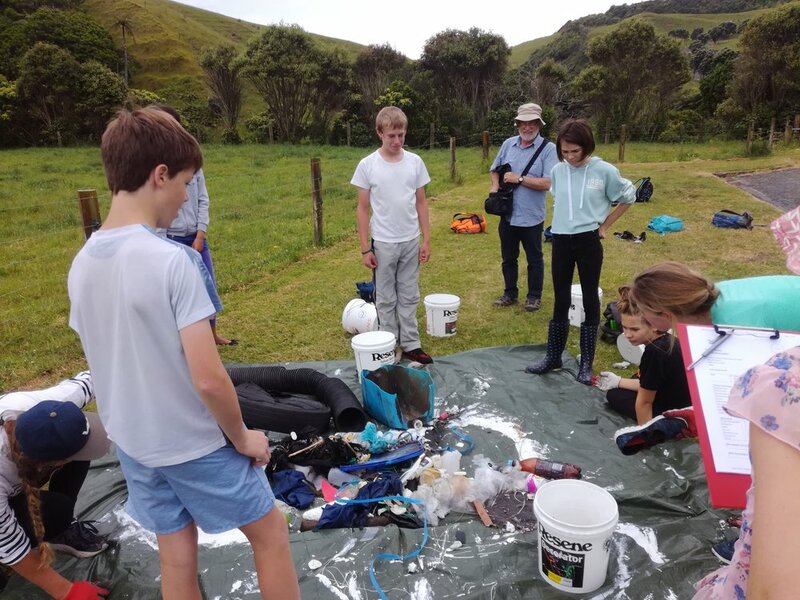 Read on to find a letter addressing the changes and the next steps for the Taranaki Environmental Education Trust from the Chair, Boyd Benton, photos from the 25th Anniversary celebration, and the last workshops before the summer holiday. Not to mention a whole calendar of great events not to be missed in our region. Graham, Founder, and Kati Freeman, Trust General Manager, catch up together at the Taranaki Environmental Trust's 25th Anniversary Celebration.